Home / Nature Therapy / What is Forest Bathing? In fact, forest bathing involves no bathing—not the kind that requires soap, anyway. 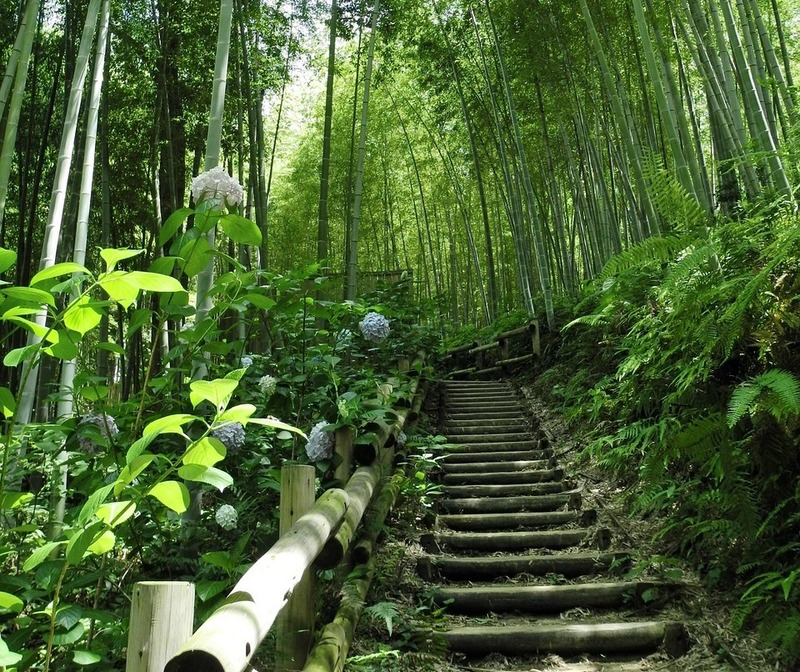 Also known as forest therapy or shirin-yoku, forest bathing is a concept that originated in Japan in 1982 and was inspired by Buddhist and Shinto traditions. It involves immersing oneself in nature for its many physical and mental health benefits, using all five of one’s senses. Sometimes it’s combined with guided activities and meditations; sometimes it simply involves slowing down to take a meditative, deliberate, slow walk under a canopy of trees. Since the 80s forest bathing’s become a cornerstone of preventative health in Japan; it doesn’t hurt that 67% of Japan’s landmass is covered in forest. In 2004 the Japanese government began research on forest-bathing, studying its physiological and psychological effects and spending about $4 million dollars on the project over eight years. Based on their results they designated 48 trails as therapy trails—and thanks to the prodigious scientific data they collected showing just how beneficial it can be, it’s slowly spreading to other parts of the globe. Many of us already know intuitively that taking a nice, relaxing stroll through the trees can be a peaceful and rejuvenating experience. It’s a sentiment that’s been oft repeated throughout history, from John Muir to Henry David Thoreau to Williams Wadsworth and all the way back to Cyrus the Great, who built gardens for relaxation in Persia two thousand-odd years ago. Long before the incontrovertible scientific evidence was there, people were espousing the mental and physical health benefits of time spent communing with nature, including wandering amongst the trees. But the new scientific research regarding forest bathing is far beyond what we might have expected. Just a few of the health benefits of forest bathing being recognized are boosted immune system functioning, reduced blood pressure, reduced stress and anxiety, improved mood, increased ability to focus (even in children with ADHD), accelerated recovery from surgery or illness, increased energy level, and improved sleep. It’s also been found to increase more amorphous but equally vital things like creativity, empathy, intuition, inspiration, self-esteem, and general quality of life. This new research is on the vanguard, exploring a frontier that actually quantifies the benefits from a stroll through the forest that can feel so abstract. Researchers like Yoshifumi Miyazaki at the University of Chiba and Qing Li at the Nippon Medical School are using techniques like hormone analysis, field tests, and brain-imaging technology to reveal how forest bathing can actually be a form of green medicine, a prescription that can have tangible and long-lasting effects on our mental and physical health. For instance, Li’s research at Nippon measured the presence and activity of human natural killer (NK) cells in the body, the immune system cells in our body that fight against infection and cancer. His study showed that after a weekend in the woods, there were significant increases in NK cell activity lasting for a month after each visit. One reason for this is the natural essential oils found in wood and plants, called phytoncides, used by trees to protect themselves from germs and insects–so breathing in forest air can actually improve our immune systems too. Are we suffering from a nature deficit? The timing couldn’t be better for all this research. 2008 marked an uneasy milestone for humanity: more people now live inside urban centers than outside of them. 82% of North America lived in urban areas in 2018. As a culture, we’re still untangling what exactly the short- and long-term ramifications of that change is, but the results so far all seem to indicate that our increasingly urbanized lifestyle isn’t doing our health many favors. In an interview with Nippon.com, Miyazaki reminds us that “because we have bodies that are adapted to nature, living in modern society places us in a condition of stress.” He thinks this shift was exacerbated by our society’s shift to computers in the 80s, reminding us that the word “technostress” appeared in the American lexicon just two years after shinrin-yoku debuted on the scene in Japan. “We have entered a secondary stage of stress,” Miyazaki claims, and all the evidence seems to back him up. In his book Last Child in the Woods, journalist and visionary Richard Louv defines nature-deficit disorder as “the human costs of alienation from nature, among them: diminished use of the senses, attention difficulties, and higher rates of physical and emotional illnesses.” From my practice I’ve come to believe it’s a true clinical problem, not just a social or behavioral one, in both children and adults. The causes of NDD include increasing urbanization without greening and digital distraction. Those at greatest risk are people who work inside constantly, especially in urban centers, and who are tethered to their devices and are relatively sedentary. NDD has many associated clinical conditions such as obesity, cardiovascular illness, attention-deficit disorder, generalized anxiety disorder, myopia, and burnout syndrome. Translation: we’re all suffering from our general seclusion from nature, and it’s taking years off our lives. But getting into nature with forest bathing is not just about managing symptoms or bringing ourselves back from the brink of high stress and high blood pressure—it’s also about the idea that we are fundamentally lacking without a strong and consistent relationship with nature, and cultivating such a thing might actually help improve us as humans. I know patients are profoundly affected by air or water pollution—respiratory conditions, skin conditions, heart disease, diabetes, not to mention depression and anxiety. 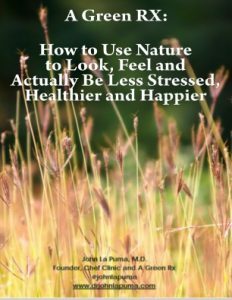 However, many are only recently coming around to the idea that being in and interacting with nature can also have significant positive health effects as well—meaning that practices like forest bathing aren’t just “nice to have” or for making us “well”; they might actually help make us measurably, medically better than we were before and be as essential as exercise, good food and sound sleep. Increasing numbers of clinicians are actively prescribing nature therapy to their patients: occupational and recreational therapists often guide their patients to therapeutic horticulture, pet therapy, and care farms; physicians in emergency medicine and other specialties often lead wilderness, green exercise, forest, and adventure groups; and psychologists and psychotherapists sometimes take additional training and practice as ecotherapists. All of these interventions fall under the umbrella of nature therapy, a burgeoning new discipline of which forest bathing is just one part. What about us city mice? So what about those of us who aren’t living in a country where 67% of the land mass is trees? How can the average city dweller get some of the benefits of forest bathing without traveling so far? Thankfully, research continues to come out that suggests you don’t have to go off the grid to get an arborial boost. Researchers in Canada specifically studied the effect of trees on those in an urban environment by measuring, block-by-block, both the distribution of green space and the health of the people living there. Even after controlling for socio-economic and demographic differences, they found that having just ten more trees on a city block “improve[d] health perception in ways comparable to an increase in annual personal income of $10,000, moving to a neighborhood with $10,000 higher median income, or being 7 years younger.” The more trees there were, the more stark differences the researchers saw. All the existing research points towards urban trees improving air quality, reducing energy use, and making neighborhoods generally more aesthetically pleasing—but it’s only in the past decade or so that we’re starting to understand just how deeply trees can affect human health and well-being. A slightly more sobering study done by the U.S. Forest Service between 1990 and 2007 studied the effect of the emerald ash borer, an invasive and devastating forest pest, on the community. In counties where trees were succumbing left and right to this pest, the number of cardiovascular and respiratory illnesses in this counties actually rose, contributing to “more than twenty thousand additional deaths” during the study period. When trees die, it’s clear: people do too—more, and more often. Spending just 20 minutes in a park seems to be a minimum dose to improve life satisfaction and lower cortisol and amylase levels, but there are few studies at this individual level: most are at the public health level, which seems remote and difficult to do something about. The forest bathing book I like the best is Forest Bathing: How Trees Can Help You Find Health and Happiness by Qing Li, who describes the practice as almost meditative, with specific sounds, sights and ceremonies. It’s a slim, thoughtful volume, and I recommend it, along with Thich Nhat Hanh’s Peace is Every Step, which is similar in some ways: it’s about walking meditation, anywhere you can walk. It’s clear that taking a moment to commune with the trees is more than just fun or peaceful—it might actually be a matter of life or death. The extraordinary public health benefits from interacting with trees and other natural resources are only just beginning to be understood and publicized. If you’re interested in learning more, be sure to check out the resources on my website. There are a few places in the United States picking up on the amazing benefits of forest bathing, so check them out if you’re in the area. If you want to think even bigger, consider volunteering for the forest conservation effort or getting involved with a tree planting initiative in your local community. And of course, the very best thing you can do today is to get outside and do a little forest bathing of your own. Whether you’re communing with one tree or one thousand trees, you’ll be doing yourself and our planet a favor.